These beautiful ecards really symbolise the Christmas holidays with a touch of glamour. 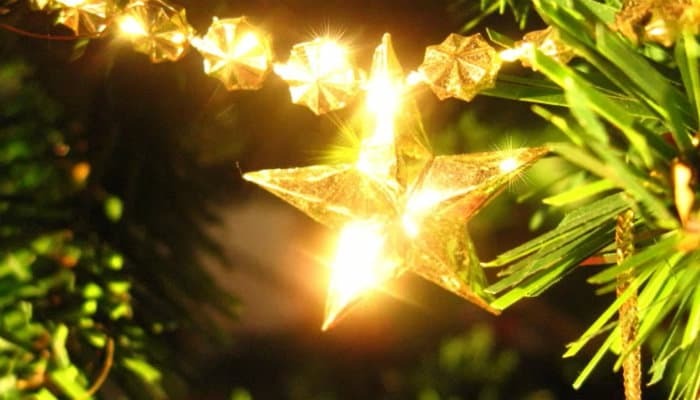 The decoration delicately hung along the Christmas tree like a string of diamonds with a stunning gold star makes a lovely centre piece and this star sparkles and shines as the card is played. The gold of the diamonds is a warm golden glow and looks very soft and glowy, adding style and sophistication to the ecards. The pine tree is a lovely rich green and looks like a real Christmas tree that the decorations are hung upon. You can almost smell the lovely pine aroma filling the air, along with other delicious smells of holiday celebrations and maybe hear a champagne cork pop! Laughter and soft music fill the air…this card really transcends you to a fun filled Christmas. Teaming this card with a soft festive track from our large range of music selections will finish the effect beautifully. You just need to add your festive message now and demonstrate the meaning of Christmas to your clients this year by sending one of our sensational Christmas ecards for business. Our ecards always aim to leave a lasting impression and with our chic images, they do just that. Your clients are bound to feel appreciated and respected. Please feel free to browse our extensive website, we have many different designs and music tracks to choose from. Register today and see for yourself how special an Ecard Shack business holiday ecards experience can be!